The first week of July every year is a very special week on the magical island of Gotland, off the east coast of Sweden. 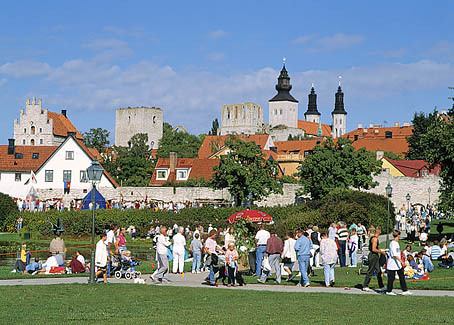 This is the week when the already extremely popular capital of the island, Visby, becomes even more over-crowded, when a very large number of politicians, policymakers, lobbyists, journalists and even one or two ordinary people gather here for the annual “Almedalen week” (Elm Valley) http://en.wikipedia.org/wiki/Almedalen_Week. I have been invited here to speak at a few different events in my capacity of being an informed (and opinionated?) patient, and look forward to engaging in discussions on “How patient-centered is Swedish healthcare in an international perspective?”, “Does increased patient empowerment lead to better healthcare at lower cost?” and other similar questions. Am I OK with being labelled “patient”? Do I see myself as a “patient”? My conclusion is that I am perfectly fine with being seen as a “patient” in certain contexts, as long as I am not seen as “nothing but a patient” or even worse “only a patient”. I can accept that in a healthcare context, I am automatically given the label “patient”, in the same way as I am automatically labelled “Frida’s mother” among my daughter’s friends. In fact, let me share a secret: in healthcare, I label myself “patient” to make the healthcare professionals feel comfortable. But no matter what, I will always be more impatient than patient!